12 oz. All Natural Soy Wax Candle Cedarwood Blend: A blend of Cedarwood & Sandalwood Oils Extreme odor eliminating soy bean wax candle blended with odor removing enzymes. Safely neutralizes unwanted pet odors using a blend of natural citrus and odor eliminating oils. Odors are removed from the air and will leave area smelling fresh and clean. 12 oz. All Natural Soy Wax Candle Citrus Blend: A blend of Orange, Lemongrass & Peppermint Oils Extreme odor eliminating soy bean wax candle blended with odor removing enzymes. Safely neutralizes unwanted pet odors using a blend of natural citrus and odor eliminating oils. Odors are removed from the air and will leave area smelling fresh and clean. 12 oz. All Natural Soy Wax Candle Floral Blend: A blend of French Lavender, Geranium Rose & Orchid Oils. Extreme odor eliminating soy bean wax candle blended with odor removing enzymes. Safely neutralizes unwanted pet odors using a blend of natural citrus and odor eliminating oils. Odors are removed from the air and will leave area smelling fresh and clean. 12 oz. All Natural Soy Wax Candle Herbal Blend: A blend of Eucalyptus, Clary Sage & Lavender OIls. Extreme odor eliminating soy bean wax candle blended with odor removing enzymes. Safely neutralizes unwanted pet odors using a blend of natural citrus and odor eliminating oils. Odors are removed from the air and will leave area smelling fresh and clean. 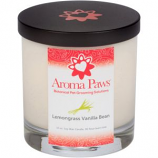 Aroma Paws All Natural Soy Wax Candles in 8 Amazing Fragrances Made with All Natural Soy Wax, 100% Unbleached Cotton, Hand poured in the US, made from American Soy Beans. Soy Wax is an eco-friendly, pure burning alternative to paraffin wax candles. 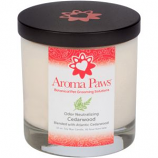 Our candles will naturally fill the air in your home with your favorite Aroma Paws fragrance. Available in 8 oz. Tin Candle & 8 oz. Glass Candle in Decorative Gift Box. 4 oz. All Natural Soy Wax Candle Cedarwood Blend: A blend of Cedarwood & Sandalwood Oils Extreme odor eliminating soy bean wax candle blended with odor removing enzymes. Safely neutralizes unwanted pet odors using a blend of natural citrus and odor eliminating oils. Odors are removed from the air and will leave area smelling fresh and clean. 4 oz. All Natural Soy Wax Candle Citrus Blend: A blend of Orange, Lemongrass & Peppermint Oils Extreme odor eliminating soy bean wax candle blended with odor removing enzymes. Safely neutralizes unwanted pet odors using a blend of natural citrus and odor eliminating oils. Odors are removed from the air and will leave area smelling fresh and clean. 4 oz. All Natural Soy Wax Candle Floral Blend: A blend of French Lavender, Geranium Rose & Orchid Oils. Extreme odor eliminating soy bean wax candle blended with odor removing enzymes. Safely neutralizes unwanted pet odors using a blend of natural citrus and odor eliminating oils. Odors are removed from the air and will leave area smelling fresh and clean. 4 oz. All Natural Soy Wax Candle Herbal Blend: A blend of Eucalyptus, Clary Sage & Lavender OIls. Extreme odor eliminating soy bean wax candle blended with odor removing enzymes. Safely neutralizes unwanted pet odors using a blend of natural citrus and odor eliminating oils. Odors are removed from the air and will leave area smelling fresh and clean. 4 oz. Odor Neutralizing Mineral Rock Crystals- Cedarwood Blend: A blend of Cedarwood & Sandalwood Oils, Extreme odor eliminating crystals blended with odor removing enzymes. Safely neutralizes unwanted odors using a blend of natural odor eliminating oils. Odors are removed from the air and will leave area smelling fresh and clean. Use these crystals in kitty litter box, in the kitchen and car. ECO-Tip: Freshen up with Odor Neutralizing Room Spray after crystals lose their scent instead of throwing away. 4 oz. Odor Neutralizing Mineral Rock Crystals- Citrus Blend: A blend of Orange, Lemongrass & Peppermint Oils Extreme odor eliminating soy bean wax candle blended with odor removing enzymes. Safely neutralizes unwanted pet odors using a blend of natural citrus and odor eliminating oils. Odors are removed from the air and will leave area smelling fresh and clean. 4 oz. Odor Neutralizing Mineral Rock Crystals - Floral Blend: A blend of French Lavender, Geranium Rose & Orchid Oils. Extreme odor eliminating crystals blended with odor removing enzymes. Safely neutralizes unwanted odors using a blend of natural odor eliminating oils. Odors are removed from the air and will leave area smelling fresh and clean. Use these crystals in kitty litter box, in the kitchen and car. ECO-Tip: Freshen up with Odor Neutralizing Room Spray after crystals lose their scent instead of throwing away. 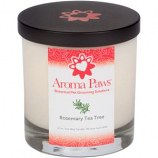 Aroma Paws 8 OZ. Memorial Candle - Royal Blue Cross, Memorial Candles are made from all natural soy wax and blended with the warm and soothing fragrance of vanilla bean, nutmeg, clove and gingerbread. Available in 12 oz. Candle Vase, Packaged in Gift Box with Bow.Choose From:Royal Blue: In Memory & Celebration of My Beloved Pet, Burgundy: You left your paw prints on our hearts, Black: Paw in Hand, Gold Paw Prints in the Sand. 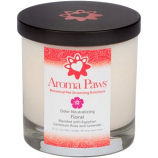 Aroma Paws 8 OZ. Memorial Candle - Burgundy Heart, Memorial Candles are made from all natural soy wax and blended with the warm and soothing fragrance of vanilla bean, nutmeg, clove and gingerbread. Available in 12 oz. Candle Vase, Packaged in Gift Box with Bow.Choose From:Royal Blue: In Memory & Celebration of My Beloved Pet, Burgundy: You left your paw prints on our hearts, Black: Paw in Hand, Gold Paw Prints in the Sand. My Furry Sunshine Soy Candle in Vanilla Nutmeg Clove Fragrance. Makes a great gift for animal lovers! 8 oz. glass candle in gift box. Aroma Paws 8 OZ. Memorial Candle - Paw In Hand Black, Memorial Candles are made from all natural soy wax and blended with the warm and soothing fragrance of vanilla bean, nutmeg, clove and gingerbread. Available in 12 oz. Candle Vase, Packaged in Gift Box with Bow. Choose From:Royal Blue: In Memory & Celebration of My Beloved Pet, Burgundy: You left your paw prints on our hearts, Black: Paw in Hand, Gold Paw Prints in the Sand. 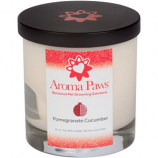 Aroma Paws 8 OZ. Memorial Candle - Paw Prints In Sand Gold, Memorial Candles are made from all natural soy wax and blended with the warm and soothing fragrance of vanilla bean, nutmeg, clove and gingerbread. Available in 12 oz. Candle Vase, Packaged in Gift Box with Bow.Choose From:Royal Blue: In Memory & Celebration of My Beloved Pet, Burgundy: You left your paw prints on our hearts, Black: Paw in Hand, Gold Paw Prints in the Sand. Puppy Love Soy Candle in Vanilla Nutmeg Clove Fragrance. Makes a great gift for animal lovers! 8 oz. glass candle in gift box.